Bristol Head, el. 12,713 feet (3,875 meters). 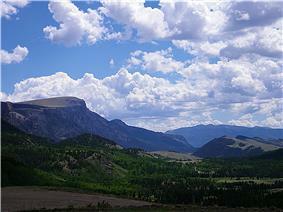 Mineral County is one of the 64 counties in the U.S. state of Colorado. As of the 2010 census, the population was 712, making it the second-least populous county in Colorado. 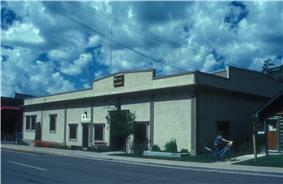 The county seat and only incorporated municipality in the county is Creede. The county was named for the many valuable minerals found in the mountains and streams of the area. According to the U.S. Census Bureau, the county has a total area of 878 square miles (2,270 km2), of which 876 square miles (2,270 km2) is land and 2.0 square miles (5.2 km2) (0.2%) is water. As of the census of 2000, there were 831 people, 377 households, and 251 families residing in the county. The population density was 1 people per square mile (0/km²). There were 1,119 housing units at an average density of 1 per square mile (0/km²). The racial makeup of the county was 96.87% White, 0.84% Native American, 0.12% from other races, and 2.17% from two or more races. 2.05% of the population were Hispanic or Latino of any race. There were 377 households out of which 22.30% had children under the age of 18 living with them, 57.00% were married couples living together, 5.80% had a female householder with no husband present, and 33.40% were non-families. 28.10% of all households were made up of individuals and 9.80% had someone living alone who was 65 years of age or older. The average household size was 2.20 and the average family size was 2.70. In the county the population was spread out with 20.50% under the age of 18, 4.70% from 18 to 24, 24.80% from 25 to 44, 32.70% from 45 to 64, and 17.30% who were 65 years of age or older. The median age was 45 years. For every 100 females there were 104.20 males. For every 100 females age 18 and over, there were 99.10 males. The median income for a household in the county was $34,844, and the median income for a family was $40,833. Males had a median income of $28,750 versus $19,375 for females. The per capita income for the county was $24,475. About 9.30% of families and 10.20% of the population were below the poverty line, including 18.70% of those under age 18 and 10.60% of those age 65 or over. Mineral County has an extremely high proportion of land under federal ownership, with 96% of the county under the management of the federal government (It houses an office of, and is surrounded by, the Rio Grande National Forest). Native silver from the Bulldog Mountain Mine, Creede District. Size 4.5 x 2.6 x 0.25 cm. Foley, N.K. et al. (1993). Mineralogy, mineral chemistry, and paragenesis of gold, silver, and base-metal ores of the North Amethyst vein system, San Juan Mountains, Mineral County, Colorado [U.S. Geological Survey Professional Paper 1537]. Washington, D.C.: U.S. Department of the Interior, U.S. Geological Survey.